Back-row forwards Sean Reidy and Jordi Murphy have been called into the Ireland squad for Saturday's game against Fiji at the Aviva Stadium. The pair have been drafted in as replacements for Tommy O'Donnell and Dan Leavy, who were injured before the record 38-3 win over South Africa. Prop John Ryan (calf) and wing Keith Earls (hamstring) will return to Munster this week for rehabilitation. 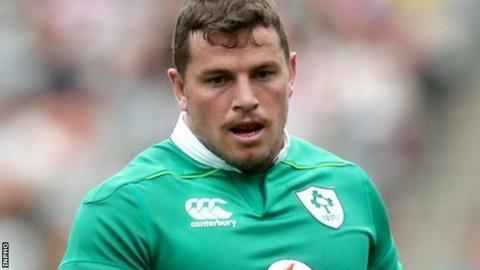 Flanker Peter O'Mahony has received a number of stitches to his ear. Ireland got their November series off to a winning start on Saturday by comprehensively seeing off the Springboks, but coach Joe Schmidt is expected to make changes to his team for the encounter with the Fijians. Earls is expected to miss the matches against Fiji and Argentina after suffering his injury in training last week, but prop Jack McGrath may come into contention again after sitting out the win over South Africa because of a hip knock. Fiji lost 19-10 to Italy in the first of their autumn international fixtures at the weekend but Ireland full-back Rob Kearney expects the Pacific Islanders to provide strong opposition. "We know the threats they have and some of their guys are playing as well as they have over the last few years. They're definitely a team on the up and improving a huge amount," said Kearney. "Individually we know they're very good. They look like much more of a well-coached side. It's definitely going to be a big challenge. "They pose a massive threat individually, the key for us is to make sure our systems are in place really well and we don't knock off to give them those individual opportunities."